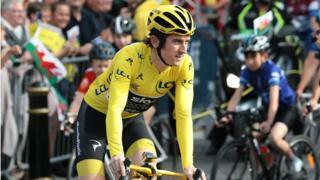 Tour de France champion Geraint Thomas has called for helmets to be made "compulsory" for all cyclists in the UK. Speaking to the Sunday Times Magazine, the Team Sky rider said he "always" wore a helmet - and felt others should do the same. "I've put on a helmet more times than I've buckled a seatbelt," he added. The 32-year-old also said cyclists and drivers should "share the road", rather than seeing each other as "enemies". Compulsory cycle helmets - what is the proof? The issue of helmets is divisive in cycling. The government said in 2017 it would consider changing the law to force helmet usage, but various bodies are against such a move. The charity Cycling UK believes there is "no justification for making helmet-wearing compulsory", arguing it could "undermine levels of cycle use". It adds: "In any case, the effectiveness of helmets is far from clear." Chris Boardman, the former professional cyclist and current Greater Manchester commissioner for walking and cycling, has also previously stated his opposition to a law change. Thomas, however, argues the development of helmet design in recent years now means there is "no reason not to" wear one. While there is no law compelling cyclists to wear helmets, the Highway Code recommends their use. The Welshman also revealed that, apart from races, he had "never ridden a bike in London". He added: "I've watched from a taxi and it does seem a bit crazy. "